Core Labs is building the future of professional identity and connection for the digital economy. We're currently in rapid experimentation mode (the opposite of stealth). Check out what we've got cooking. 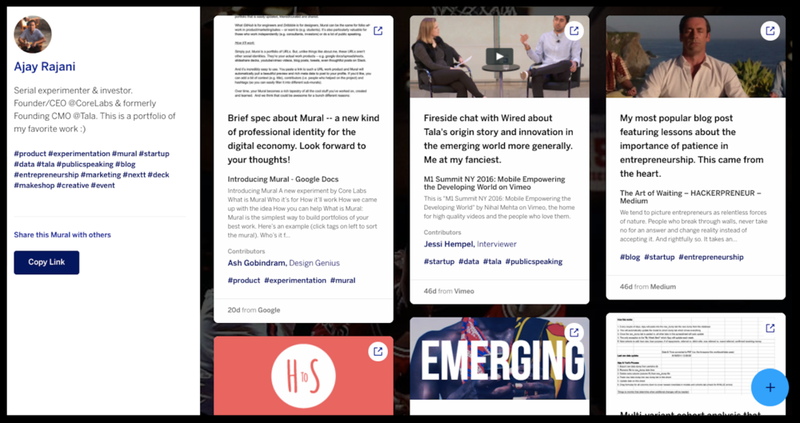 Mural is an insanely simple way to build portfolios of your best work. What Dribbble is for designers & Github for engineers, Mural aims to be for product managers, marketers and other digital workers. Makeshop is a genius bar for creative services distributed across co-working spaces and coffeeshops. Our aim is to make creative help from professional designers, copywriters & strategists as accessible and easy as a cup of coffee. - Currently piloting in 3 NYC locations and via video calls throughout the country. - Patrons in need of design or copy help can book one-on-one, in person sessions with a creative -- in just a few clicks. - Sessions start as low as $45. 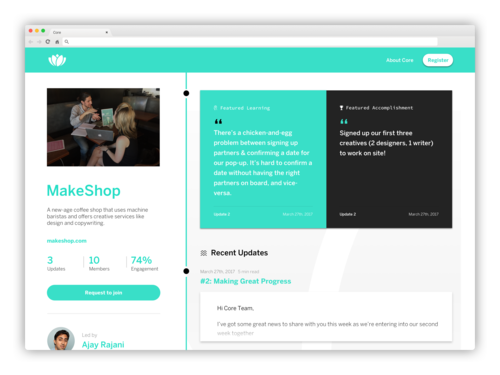 Core is a new take on peer and expert mentoring. The software is live at leading universities across the country, where it helps power mentorship for entrepreneurship programs and fellowships. Ajay is a serial investor & entrepreneur. Before founding Core Labs, he helped build Accel-backed Grovo (Head of Product) & Sacca-backed Tala (Founding CMO). He’s also a mentor for Techstars & the UN Entrepreneur Accelerator, and invests in startups via the Inevitable Collective. More than anything, he’s an addictive experimenter. Avishkar is a programmer skilled in a variety of disciplines and technologies. Prior to leading engineering at Core Labs, Avishkar spent 5+ years as Software Engineering Manager at Grovo and earned his B.S. in Computer Science from NYU.